On pressing helps in tightening it automatically. It is designed with the hand strap and stand and can be used only in homes. Bizinto 5m Self-retract Flexible Metric Measure Tape, UV_HTN_22 is a premium quality Measuring Tapes from Bizinto. Moglix is a well-known ecommerce platform for qualitative range of Measuring Tapes. All Bizinto 5m Self-retract Flexible Metric Measure Tape, UV_HTN_22 are manufactured by using quality assured material and advanced techniques, which make them up to the standard in this highly challenging field. The materials utilized to manufacture Bizinto 5m Self-retract Flexible Metric Measure Tape, UV_HTN_22, are sourced from the most reliable and official Measuring Tapes vendors, chosen after performing detailed market surveys. Thus, Bizinto products are widely acknowledged in the market for their high quality. 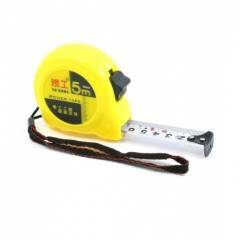 We are dedicatedly involved in providing an excellent quality array of Bizinto Measuring Tapes. You can easily read the markings even in low light. This measurement tape is made by good material iron, long lasting and can measure anything. Delivered in 4 days, don’t think that this is bad delivery time. Overall gud buying experience.